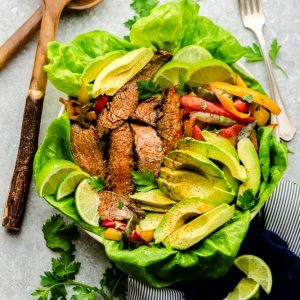 Asian Sesame Steak Fajita Salad combines all your favorite flavors of fajitas along with a sesame lime cilantro dressing into one jam-packed and flavorful salad! Best of all, you can make this on the stove or your grill which is perfect for those warm summer evenings. Low carb, keto and paleo. PIN HERE for later and follow my boards on Pinterest for more lunch ideasSummer is here in full swing and we’ve been finding every excuse to toss all the things onto the grill. Tons of fruit, frozen treats and loaded salads are life right now. This Asian Sesame Steak Fajita Salad has been making it’s way onto our dinner rotation regularly for the last two months. It comes together in just 30 minutes and is loaded with a TON of flavor. Best of all, it’s also low carb, keto and paleo friendly. You can cook the meat using your skillet, or toss it onto your grill. Throw in some crunchy red and yellow bell peppers, creamy avocado, crunchy romaine and anything else you can scrounge around in your pantry. Some sweet grilled corn or avocado slices – whatever you want! CAN I MAKE THIS ASIAN SESAME STEAK FAJITA SALAD AHEAD OF TIME? Yes, this Asian sesame steak fajita salad would make delicious leftovers. You can make it on your meal prep Sunday for work or school lunchboxes. Top with cauliflower rice and pack the lettuce separately in a zip-top bag and add dressing when you’re ready to enjoy! This Asian Sesame Steak Fajita Salad is a tasty meal that’s jam-packed with goodies. Make the marinade/dressing: Whisk all the marinade ingredients together. Reserve half of the marinade in the fridge to use as the dressing and pour the remaining half into a large resealable zip-top bag. Add steak to bag and marinate for at least 15 minutes. Meanwhile, prepare the other ingredients and start cooking the bell peppers. Drain the steak and discard the marinade. Preheat grill or grill pan and allow to get very hot. 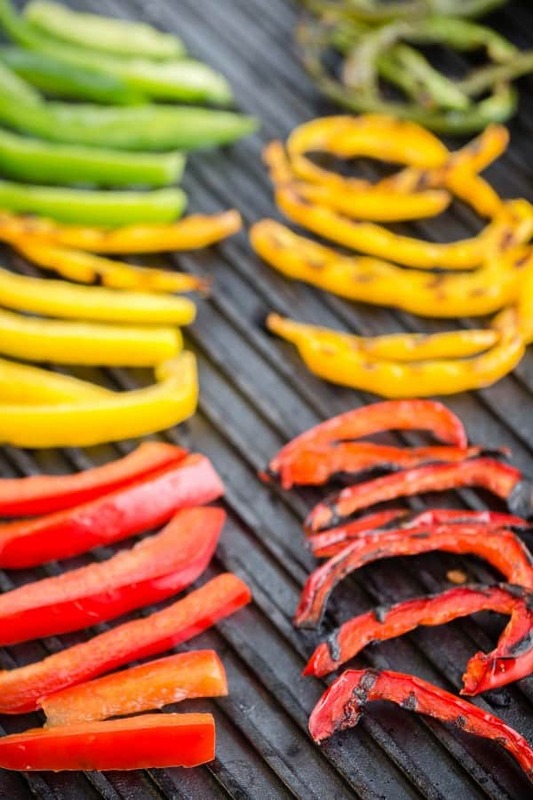 Lightly oil the grill grate or a grill pan, and place bell peppers on top. Cook for 2-3 minutes per side, or until grill marks appear. Remove from grill and transfer to a plate. Remove the steak from the marinade and gently shake off any excess. Grill for about *3-5 minutes per side, or to the desired doneness. Transfer steak to cutting board and allow to stand for 5 minutes. Cut across grain into thin strips. Heat 1 tablespoon olive oil in a large cast iron frying pan or skillet on high heat. Place the steak in a hot pan and allow to sear for 3 to 4 minutes on each side, or until desired doneness. Transfer steak to cutting board and allow to stand for 5 minutes. Cut across grain into thin strips. Quickly wipe down the pan and return to medium-high heat. Add remaining 1 tablespoon olive oil in the skillet. Sauté the peppers, stirring often, for about 6-7 minutes, or until softened and slightly caramelized. 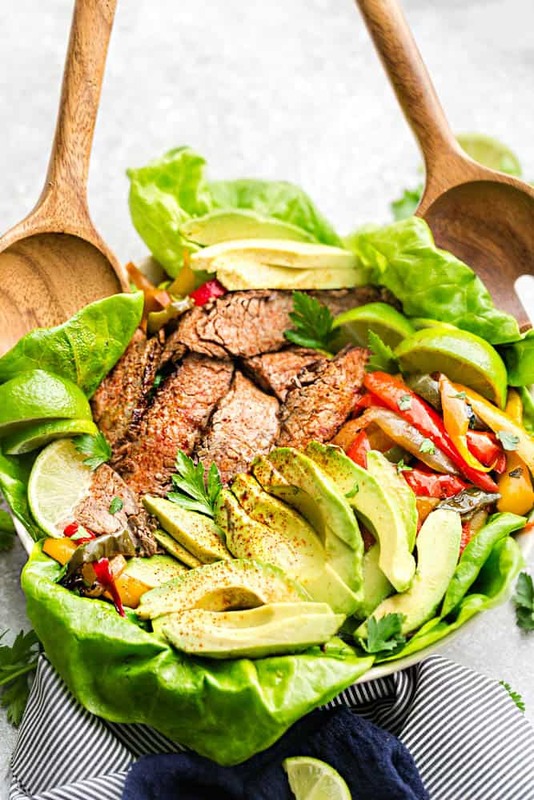 To assemble the salad: While the steak and peppers are cooking and resting, add lettuce to a large bowl and gather and slice the avocado. Add to the bowl with corn (if using) then top with bell peppers, steak once ready. Drizzle with reserved dressing and sprinkle additional chopped cilantro and give another squeeze of lime, if desired. 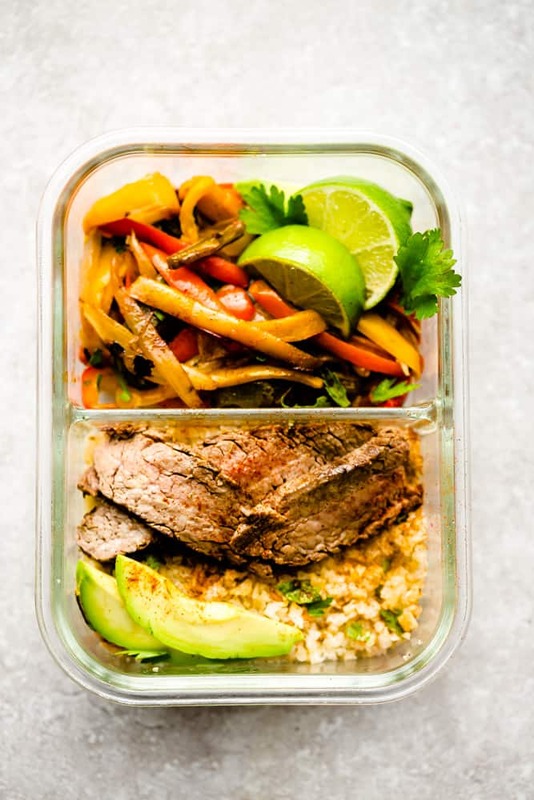 Divide the steak and peppers into lunch containers with cauliflower rice. Divide the lettuce into four small zip-top bags or plastic wrap. Pack dressing separately and combine when ready to serve. *you can also use Thai sweet chili sauce & reduce honey to 1 teaspoon or use more) or add an additional 1 tablespoon of soy sauce instead if you can't find fish sauce or would rather not use it. It won't have that same umami flavor but will still taste great. wow look at all those steak slices…so tender and juicy. A fabulous summertime salad, Kelly. Grilling and salads are definitely perfect for summer, especially when it’s ready in just 30 minutes! 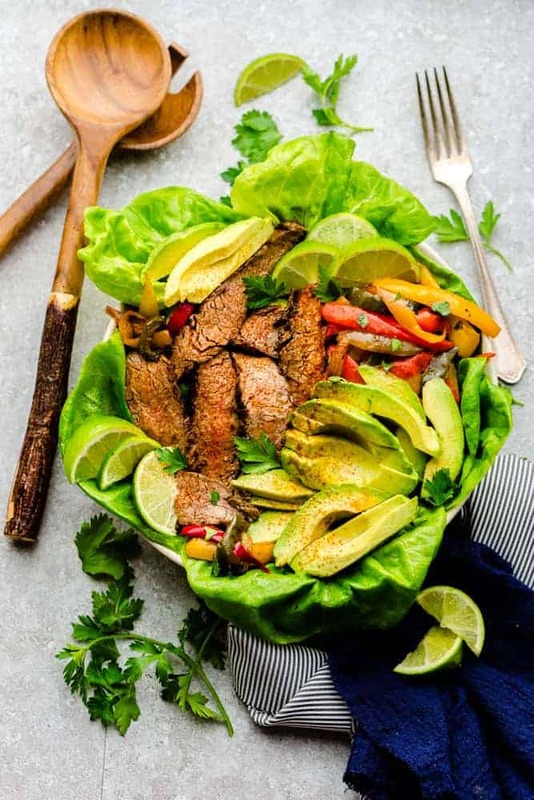 This steak fajita salad looks incredible, Kelly! I was just telling my husband that we need to grill steaks soon, so this would be perfect. Love the Asian flair, too! This sounds so good, Kelly! And I love marinade recipes that double as dressings! Definitely perfect for streamlining things and getting lunch/dinner on the table quickly! Oh my goodness, Kelly! I don’t eat steak too often, but I do love it and this salad sounds amazing. That dressing sounds to die for too. We don’t eat steak very often but would absolutely love this salad! Love the infusion of Asian flavors too! I am with you in the salad love, girlfriend! And you make some KILLER salads!!! So if your husband doesn’t want his, feel free to send it my way!! 😉 Love this one (of course)! The fajita flavors with an Asian spin sounds FAB! And I love that the sesame lime cilantro dressing doubles as a marinade! Absolute perfection, Kelly! Pinned! Cheers, girlfriend! Hi Kelly, gorgeous, stunning fajita salad. You make beautiful salads — love’m all. Love asian flavors like anything and these bright pictures are making me drool. This salad has so many gorgeous and varied colors and flavors! Oh my goodness, it’s no wonder your husband is on board with this one, it looks AMAZING! I definitely want to try it! What a beautiful salad Kelly, love all the color and flavors you have going on here. I love these 30 minute Thursday meals! This fajita salad looks so delicious and perfect for this hot weather! I don’t know which I want more – the corn or that dressing! OMG, Kelly! This looks absolutely delicious!!!!! I love the asian style flavors in the fajita! And all it takes is 30 minutes to make this!!??? MAJOR YUM! Oh my goodness, Kelly! This salad is SO gorgeous and I just know that this is one salad that would please all the meat-lovers in my family! Love the Asian twist so much! What a great combination of flavors! It looks so healthy and delicious! Haha, we’re kind of on the same wavelength this month! Main dish salads – and talking about how our husbands don’t think it’s a meal! This salad I think mine could get on board with though, there is steak involved, after all – can’t wait to try it! Your flank steak is seriously perfectly cooked (does your hubby get credit for that? ; ). This is my kind of dinner – very well balanced and I won’t leave the table hungry in an hour. It’s gorgeous to look at, too. Hope you are having a great summer so far. I love grilled veggies and steak in a salad. There is something about the flavors that make it so much better! I could eat this salad every night for dinner during the summer time. Yum! Plus 30 minutes…SCORE! This looks delicious, Kelly! I love all of the grilled veggies you’ve added to this salad, and the dressing sounds so flavorful! !